What a fortnight! 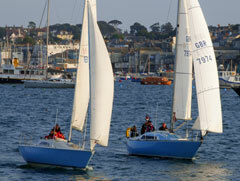 Falmouth Week, then Fowey feeder and the start of the Half Ton Cup! Tuesday saw the Half Toners go of on a marathon 29 milers into a short easterly lop with wind, lots of wind! We managed to get crew for Trifle and I got to FSC early to find Charles Choak the race officer ably assisted by Inez waiting to get kit to put on Minx the committee boat. That done we went out to the boat and set up the sails, choosing a No2 as it was a brisk easterly. Minx anchored south of Trefusis mark. Eighteen boats came out to brave the wind as the open boats G and B (most of whom were up at Fowey anyway)classes were cancelled. The Firebirds also thought better and stayed at home. Seven Q class started and had a good thrash to windward to west narrows, rounding to port and a soldiers reach to North Bank. Five U class started and followed Q class. Trifle got stuffed over the line and after a return played catch-up. Later on “Later Ron” (Jones) came out to sail Deep Purple round behind us. Five W class yachts then went off and Len Cheshire was a smiley man as the strong wind favoured Sweet Friday. One lonely Sunbeam Halcyone sailed by Gilly Fox had a start and sail over. David Cunliffe later told me in the clubhouse that he had a new scratch crew and he got them to set spinnaker in the bay as they went to Gyllingvase mark. However it was Excelle, John Fox who took the first place with Encore a good second place. After playing catch-up Trifle managed to pass Kaimana, Nigel Rowe at the St Mawes turning mark and drew out on the spinnaker run to Castle and finish Len Trenoweth in Gap Year was a country mile ahead but worryingly for Trifle Mary Boon, John Cruise was too close for comfort and Gap Year took the first place with Mary Boon beating Trifle by 3 minutes on corrected time. Len Cheshire won the W class two minutes ahead of Amneris, Mike Robson. 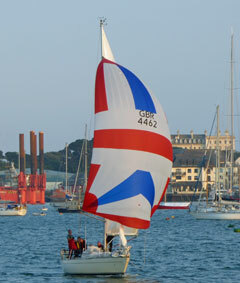 Two guests, James and Matt sailed with Trifle and Sweet Friday and we were greeted with cheers and waves from their families on the quay as U fleet finished with a flourish of spinnakers. The club was full of banter and sailing chat and although down on numbers it was a lively evening with a glorious sunset. Thanks to Jeannette and Sue who came fresh off the water from the HTC event to man(?) the ops room with Malcolm likewise doing the results; and to Charles and Inez; and the rest of the support crew.